If you have been reading this blog for awhile, then you will be glad to hear that my husband just finished his first year of DPT (Doctor of Physical Therapy) School. I am so excited and so proud of him. He finished the year off right by getting A’s on all of his finals. Let’s get into what we are actually sharing about today. You have heard me talk about the importance of building the “know, like and trust factor” with your clients. One of the best ways to do this is with a blog. Not too long ago, one of my favorite blogs, Copyblogger published an article about building the “know, like and trust factor”. The author, Georgina El Morshdy, gave 30 ways to do it. I am going to break down 3 of them for you today with my own spin. Establishing yourself as an expert in your niche. The content you produce on your blog is a great way to establish yourself as an authority is your niche. Ideas include coining terms that describe your ideas. Be creative and don’t be afraid to get a little personal. Now that your audience knows you, it is time to get them to like you. I loved the way Georgina’s article put it, and I’m not sure if there is a better way to say it. People will like you and what you have to say when they feel like you’re being real and authentic with them. Also, don’t forget to be nice. I have little tolerance for negativity bashing and it makes cringe when I see others doing it. Be nice, be real, and be authentic. I believe one of the best ways to achieve the trust factor with your audience is to be consistent. That means posting articles when you told them you would and apologizing to them when you don’t. It means posting quality information every time. I highly recommend reading Georgina’s entire article published by Copyblogger and you can find it at: 30 Ways to Build the “Know, Like, and Trust” Factor that Grows an Audience. 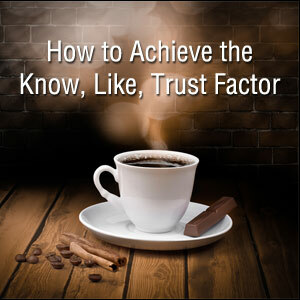 What would you recommend on how to get the “know, like and trust factor” with your clients? Have you found a great and easy way to achieve this?